CLOX is an easy to use world clock app giving both desktop and mobile users analog and digital clocks showing the time in different world time zones. You can pick whichever timezones you want to display and you also get a 'Daylight Map' which tells you, at a glance, where it is night and day in different parts of the world. There's also a built-in news feature and timezone search facility providing users with frequently updated information about timezones and clock changes worldwide. It comes with a calendar too. CLOX 8 offers a wealth of customization possibilities, with just a couple of clicks you can change almost everything about the way the app looks and feels. Whilst being a little different from previous versions of CLOX, version 8 continues to provide users with an exceptionally high quality software product at a bargain price. What's more, CLOX is no longer just for Windows; the new mobile versions are virtually identical in every way to the new Windows version. These screen shots were taken from CLOX 8 for Windows but they could just as well be from a small-screen (320x480) mobile phone. The new design means that CLOX 8 will work beautifully on any popular screen type from the smallest smartphones and tablets upwards. The examples here show just a tiny selection of the countless possible ways to set up CLOX. You can see a few more screenshots here. 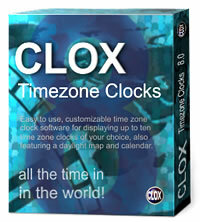 CLOX 8 can display up to 12 time zones and including up to 10 analog clocks at a time. "Never a day goes by when I don't rely on CLOX for keeping me on time and making sure I switch radio stations on time, which is quite essential for my work as a researcher. I will certainly be purchasing for my HTC One mini as well." CLOX is inexpensively priced. When you register CLOX you join thousands of other CLOX users worldwide who appreciate the value of having a simple and accurate way to keep an eye on what the time is in a number of important locations. Our CLOX software has been in use extensively by military oufits and huge corporations around the world. Its elegant simplicity and trustworthiness have always been key factors in its popularity. Now CLOX 8 has been made even more straightforward and intuitive to use, so much so that you may not even need to read the supplied instructions, especially if you already know how timezones and daylight saving time work. Nevertheless a helpful user guide is included and there's always free email support at hand if you need it. When you order CLOX, after your payment has cleared, we will send you the software and activation instructions. Registered users of earlier versions of CLOX can get CLOX 8 (Windows version) free of charge; please read the FAQ for further details. CLOX 8 is currently available for Windows (7 to 10), Android (4.4 to 8.x) and Windows Phone (8 to 10).